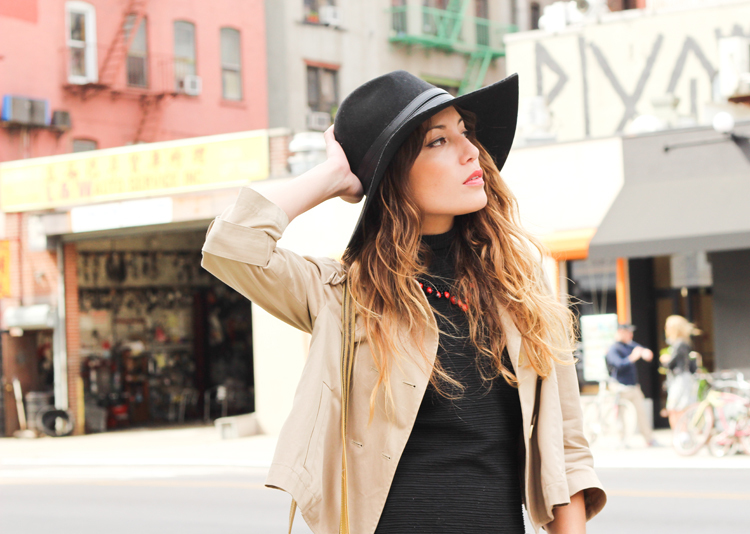 Taking you on a little urban safari in the streets of the LES. BB Dakota turtleneck dress, Alexander Wang cropped trench (similar here), Vintage crossbody bag, Beaded necklace from Malaysia, Nasty Gal Panama hat, Lorrie sandals c/o Coach (on sale here). Shot by Erica Lavelanet. When it comes to wardrobe staples, you can never go wrong in a timeless, khaki trench. Which is why I'm loving that Alexander Wang created his own take on the trend with the boxy, cropped number that you see here. I've had this jacket for a few years now and always find myself returning to it when the weather warms up. Easy-going and easy to wear with anything, it's the perfect outfit topper on warm days that turn into crisp nights. Here I paired it with a black minidress, oversized hat and tribal accessories for my own lil urban safari on the mean streets of the LES. This look is right on point! You look amazing.